Ring out the old ring in the new! Ring out the false, ring in the true. Happy new year all! This is a great example of a song that for the first 17 listens I did not like (its not a good song for so many reasons) but it got into my brain and for some idiotic reason that belies all trace of common sense I now really enjoy hearing it. Its also a great answer if you're ever asked to name obscure solo Beatles/George top 40 UK singles. 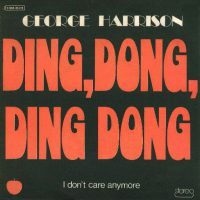 A fellow Beatlemaniac and I have been arguing about George's middle eights for years, I think the one in this song qualifies as one of his most uhhh what. It's not like he can't write good ones, cf Miss O'Dell that's quite acceptable. That could make a good topic, hmm.